If you're scouting for a casual yet absolutely chic getup, consider teaming a black coat with black capri pants. Both pieces are totally comfy and will look fabulous paired together. When it comes to shoes, this look is round off really well with Joshua Sanders platform loafers with print. If you're searching for a casual yet totally chic outfit, try pairing a black and white check blazer with black and white check skinny pants. Both items are totally comfy and will look fabulous together. Bring instant interest and excitement to your look with black leather platform loafers. This combo of a pink fur coat and navy ripped skinny jeans is clean, stylish and very easy to recreate! Amp up the cool of your outfit by completing it with Joshua Sanders platform loafers with print. If you're looking for a casual yet chic getup, pair a navy coat with blue skinny jeans. Both items are totally comfy and will look fabulous paired together. Joshua Sanders platform loafers with print are a smart choice to round off the look. If you're on the lookout for a casual yet stylish ensemble, make a grey horizontal striped crew-neck sweater and a light blue midi skirt your outfit choice. Both items are totally comfy and will look fabulous paired together. Got bored with this outfit? 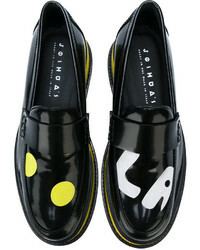 Enter Joshua Sanders platform loafers with print from farfetch.com to jazz things up. For a casual totally chic ensemble, pair a charcoal coat with black fringe dress pants — these two items go perfectly well together. Black leather platform loafers work amazingly well here. If you're all about relaxed dressing when it comes to your personal style, you'll love this chic pairing of a beige oversized sweater and black and white vertical striped leggings. Bring a touch of sophistication to your outfit with Joshua Sanders platform loafers with print. If you're looking for a casual yet totally stylish getup, wear a white coat and grey skinny jeans. Both items are totally comfy and will look fabulous paired together. For footwear, rock a pair of Joshua Sanders platform loafers with print. For a casual totally chic getup, try pairing a beige leopard fur coat with a black mesh midi skirt — these items the place of work really well together. When it comes to footwear, this look is finished off nicely with black leather platform loafers.